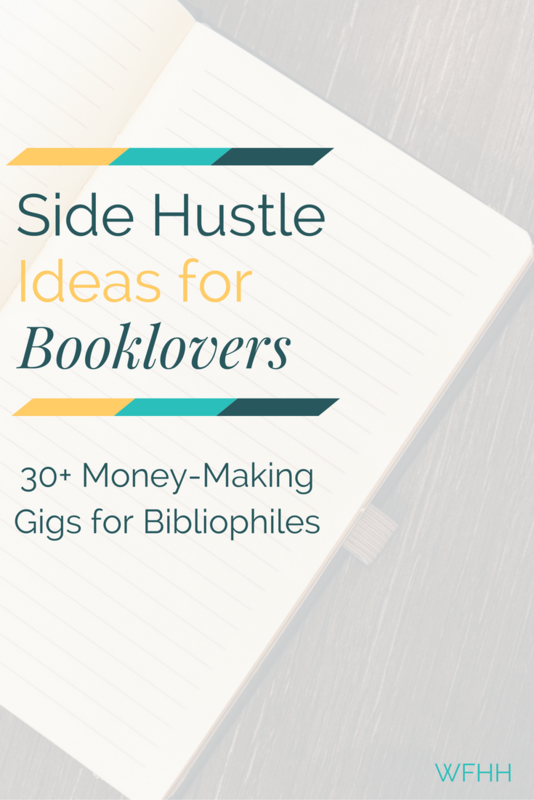 The post Side Hustles for Booklovers: 30+ Money-Making Ideas for Bibliophiles appeared first on Work from Home Happiness. As a self-proclaimed bookworm, I’ve spent many an evening reading the latest best-seller or happily re-reading a favorite page-turner. And this love of books, old and new, has led to a couple of side hustles over the years — ones that made good use of my book-loving ways. If you’re a fellow bibliophile, you might be interested to know that you too can make some money on the side. How? Why, a booklover’s side hustle, of course. Some of the best ways to make money are doing things you love. That’s why, if you can, turning a hobby or interest into a revenue stream is a favorable way to earn. Because, really, when you’re doing something you love, it never feels like you’re actually working. Every time I’m in my local Goodwill, Salvation Army or other second-hand store, I always take a stroll down the book aisles. Sure, I like to browse the titles looking for something for myself, but I’m also scouting for books to resell. And it’s really easy to find valuable books for cheap that you know will sell for a profit. How? A free and simple app called BookScouter. All you do is scan a book’s ISBN barcode and, voila, the BookScouter app will let you know how much it’s worth if you sell it on popular sites like Chegg, Abe’s Books, or Barnes & Noble. When I lived by a university, I would alway go to a nearby Goodwill scouting for used textbooks — and it paid off. It wasn’t uncommon to find a textbook or two that ended up selling for $100 or more. But you don’t have to live near a college to make money selling used books. Many titles from self-help to sci-fi can be worth something. That’s why it’s so important to use BookScouter. It will let you know what sites are willing to pay you for a particular title. Then you just have to go to the site, fill in the product details, and ship the book in — and, nine times out of ten, they’ll cover the cost of shipping. Within two weeks, you’ll usually receive payment through Paypal or check. That’s it. If you’re gonna be at the second-hand stores anyway, you might as well do a little scouting on the side! After you read a book, you know you have an opinion — something that ranges from can’t put it down page turner to ho-hum predictable. But what you think to be the next bestseller may not be so great to me, and vice versa. That’s why book reviews are so important — they give potential readers an insider’s glimpse of the goings on from chapter to chapter. If you have previous experience critiquing books, Kirkus has freelance book reviewer positions available. These are project-based gigs. After you’re assigned a book, you have two weeks to submit your 350-word review. You can also find copywriter positions here that would be a perfect side hustle for the booklover. Most tasks involve writing promotional content for new books. However, some assignments may include writing book descriptions and back cover content. BookLook – Do you have a blog? Are there 30+ people following it? If so, you can apply to become a book reviewer at BookLook. As a reviewer, you’ll receive each book you review for free. This is a great way to build experience as a reviewer! Any Subject Books – There are a variety of books available for review here. Payments vary depending on the length of the book. You don’t have to review a minimum number of books which makes this a great side hustle for the busy booklover. If you read a lot of books, I bet you have the skills to write a book, too. It’s true. In fact, avid readers are some of the best writers. And with the soaring popularity of ebooks, it’s never been easier to pen your own fiction or nonfiction work and make some pretty good money while doing it. In fact, you can easily write your very first ebook in just 30 days. Of course, if you’re particularly strapped for time, you can always take 45, 60, 90 days or more. But it’s not a stretch to think you could set aside some spare time every day to devote to writing an ebook. What’s great about writing an eBook is you can use platforms like Kindle Direct Publishing to get your book up for sale quickly. And with a reach of million of worldwide readers, this can be an easy way to passive income success — after all, you write the book once and collect sales over and over again! Those who love to read are generally pretty fond of language and words. And this is great news for the would-be side hustler — after all, there are plenty of word-related ways to earn extra money from home. I bet this is a side hustle you’ve never heard of before. But really, it can be a great income generator for word nerds out there. But what is scoping, you ask? In a nutshell, scoping is editing transcripts for court reporters. You see, court reporters use steno writers to take down what is being said. Software is then used to turn their work into readable transcripts. But computers aren’t perfect (at least not yet). They miss subtle nuances, punctuation, wording, etc. — and that’s where a scopist comes into play. If you’re a lover of language, you’ll equally love this side hustle. And the best part? The pay is great and the training is affordable. This side hustle can easily go from extra income generator to full-time wages. To explore scoping a little more, check out this free course over at Internet Scoping School. ACT – Remember the ACT? You can get paid to read and score student-written ACT essays. To be considered, you will need to have at least a bachelor’s degree and previous teaching experience. U.S. residency is also a must! Brainfuse – As a Brainfuse Paper Reviewer, you’ll help students writing college-level papers. This can include reviewing essays and providing feedback to live one-on-one tutoring sessions done over a virtual whiteboard (no webcam or mic needed). To be considered, you’ll need to supply proof of a bachelor’s degree in any field. ETS – ETS has both location-based and subject-specific scoring positions available. It’s best to check their job opportunities page to see current open positions. Gradiate – You’ll earn $25/hour as a Gradiate Genius. This is mostly grading work and providing feedback that students can use to improve. Literably – This is part transcription, part evaluating. You’ll listen to elementary students read out loud and note whenever they’ve made a mistake like omitting words or mispronunciations. Measurement Inc. – You’ll need a bachelor’s degree in any field to work from home as a reader/evaluator at Measurement Inc. There are a number of different projects available, each with different pay rates. Pearson – Pearson is one of the largest education companies around, and they often have a number of online evaluator positions available. Check out their scoring at home program to see what kind of projects they’re hiring for throughout the year! WriteScore – WriteScore offers hand-scored essay services in the education industry. They will train essay scorers, but you’ll need at least a two-year degree to be considered. Review-based blogs can be a fun way to monetize your personal thoughts. And if you have a particular niche you absolutely love, you could solely focus on that. For example, if you love romance novels, set up a blog devoted to discussing and sharing some of your favorite reads. Or if science-fiction is more your thing, give readers your thoughts on the latest and greatest to familiar favs. A book review blog could be monetized with affiliate marketing. For example, you could recommend titles for purchase via Amazon and earn a percentage of each sale through the Amazon Associates program. Remember, blogging as a side business is a lot of work but, when done right, can lead to full-time income for part-time work. Do you spot spelling mistakes while reading everything from cereal boxes to billboards? Do you know what it takes to make good writing great? Well, then, you’d make a great editor or proofreader. And, honestly, that’s not surprising. Most diehard readers are often inherently great editors — it just goes with the territory. Fortunately for you, there are plenty of ways to make money as a proofreader or editor. You could start your own proofreading side hustle, take a free introduction course to proofreading, or contract with one of 16+ companies as a virtual proofreader. Reading is a great way to pass the time but it can also lead to extra money in the bank each month. With these booklovers’ side hustles, you can take your love of the written word one step further by turning it into a side hustle. Did I miss anything? Have a question? You can leave it in the comments below. I’m here to help! This post contains affiliate links. Please see my disclosure statement to learn more! Next Do California S Corporations Save Taxes?